Speed about 60. Rolling hills on hwy 66 between tulsa and okc. I might had the 89 oct real gas.. it was a bit foggy. Also the truck has a cover over the bed and 40 psi all around. 16 k miles..
if you look at the pic.. each bar represents the five minute average.. and the east wesr line represents 29.3 mpg. 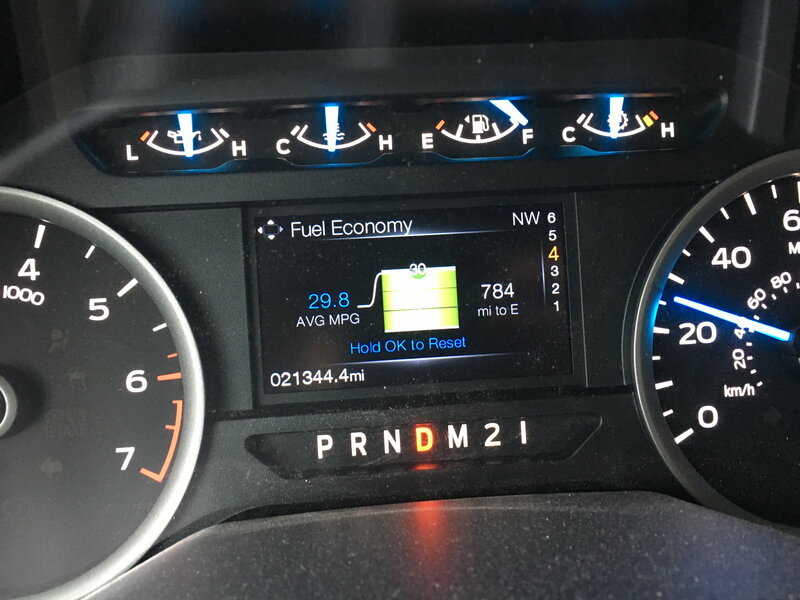 A few of those bars, five minute periods are over 30..
personally, i think the engine runs lean in 70 deg high dewpoint situations..
My wife's crew 2wd with 3.15 averages 25 on the highway cruising 65-70, and 21 mixed on her normal daily drive. My reg cab 2wd 3.31 locker averages 26-27 highway cruising 65-70 and 20-21 on my daily commute doing 80-85 with 90% highway driving. I am averaging 17.2mpg (13.3L/100km) after 1056mi (1700km). Last fill up was after a month of all city driving and it was 15.2mpg (15.3L/100km). Hope to see it improve, I think the fact that my city trips are so short it's hurting things. Truck is showing about 2mpg better than my hand calculations. 28 mpg on my last big trip 1000 miles. Most of the time 70 mph also. 2018 2.7 screw 3.55 gears. 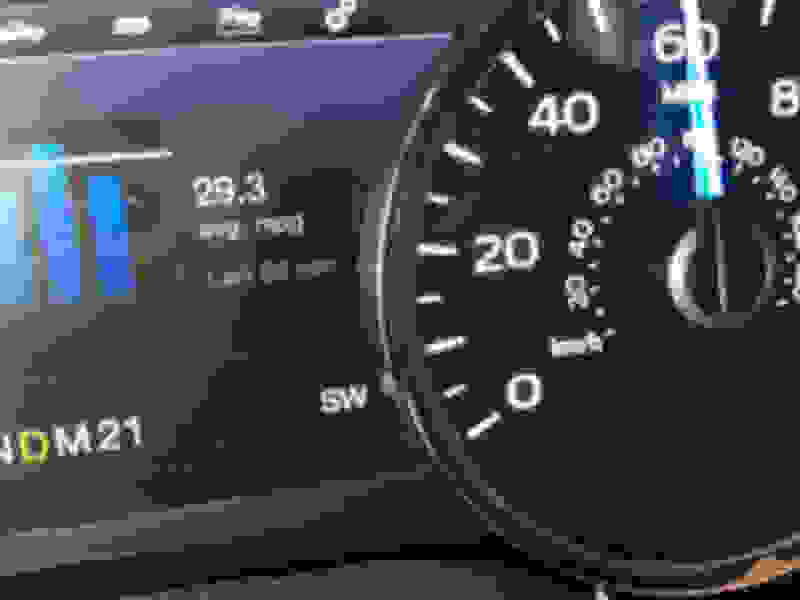 2018 Screw XLT 2.7 10 speed, after 1500 miles avg 18.2, hwy I am at 75 plus miles per hr, when I drive 65 mileage appears to get better as does when I use cruise. I started to use cruise locally, a mile or more Ill put it on, and that also seems to increase mileage. Problem is that the motor is too much fun when you put your foot into it! So you're the guy? 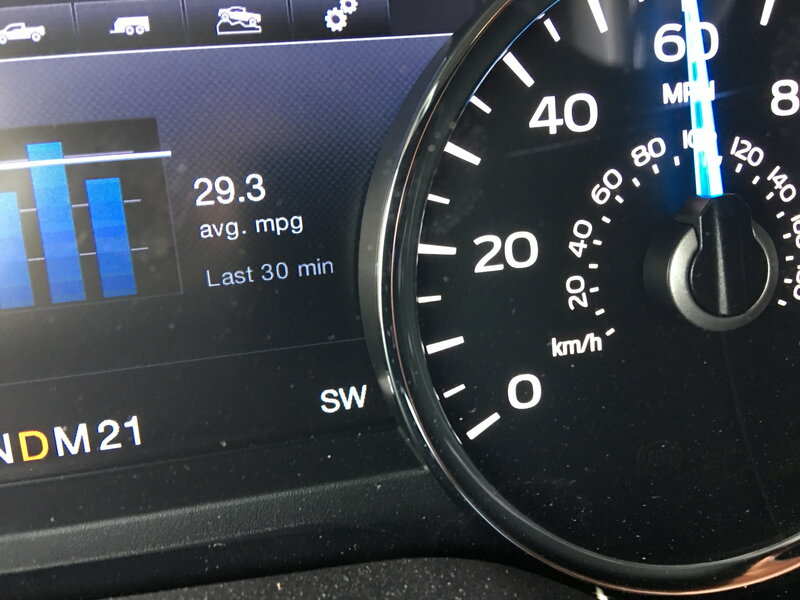 According to FUELLY, there is "1" 2.7 getting 28MPG out of 409 vehicles. Seeing, yes this is hand calculated, in the mountains of Southern WV, 20.4 Summer 19.4 Winter. I had a 2015 Tacoma Crew Manual 4WD 4.0 that the best I ever got was 18.5. The Toyota had nowhere’s near the power, room or comfort. At 56 I drive pretty easy. My highway numbers are about 22.7, got 23.5 one time and that was interstate 81 in Virginia.